Mr Ramaphosa has been sworn in as the country's new president after he was the only candidate in an election in parliament. He has said his priority is reviving South Africa's battered economy. Shortly after winning the bitterly contested ANC leadership battle, he said "we must all do all we can to ensure that we turn our economy around". Profile: Who is Cyril Ramaphosa? But Mr Ramaphosa has now finally realised that dream. 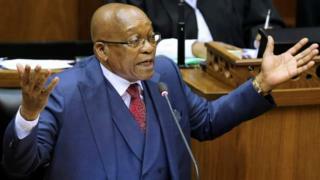 But unless he is able to bring Mr Zuma's supporters on board, and address the issues in the economy, his time as president could prove to be short-lived.